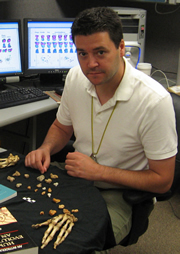 Matt Tocheri is Canada Research Chair in Human Origins, in Lakehead University's Department of Anthropology. He is also a Research Associate in the Human Origins Program at the Smithsonian Institution’s National Museum of Natural History. He received his academic degrees in anthropology from Lakehead University (HBA) in Thunder Bay, Canada, and Arizona State University (MA and PhD) in Tempe, Arizona. Matt’s main research interests surround the evolutionary history and functional morphology of the human and great ape family, the Hominidae. His work on the wrist of Homo floresiensis, the so-called ‘hobbits’ of human evolution, received considerable attention worldwide after it was published in 2007 in the journal Science. Matt’s other recent publications appear in Nature, PNAS, Journal of Human Evolution, American Journal of Physical Anthropology, Journal of Anatomy, International Journal of Osteoarchaeology, Dental Anthropology, and Journal of Vertebrate Paleontology. He is also a co-author of The Osteology of Infants and Children, available from Texas A&M University Press.